PERSONAL ESSAY: The Rafu’s Demise? End of an Era? Does Anyone Care? You are at:Home»English»Columnists»PERSONAL ESSAY: The Rafu’s Demise? End of an Era? Does Anyone Care? Around 2009, after hearing about the financial problems The Rafu was undergoing, I wrote an article, “Save The Rafu!,” asking readers and any interested people in the community to gather at a forum to share ideas and make concrete suggestions to keep The Rafu going. Over 100 people, both Japanese-speaking and English-speaking, showed up at the Gardena Valley Japanese Cultural Institute. Alan Nishio, Gwen Muranaka and I met to plan the format. We were skeptical that many people would care enough to show up and planned on 25. When 100 showed, we were shocked … and hopeful. One of the main suggestions was to form an advisory committee to offer support and advice to the Rafu publisher, Mickey Komai, and staff. 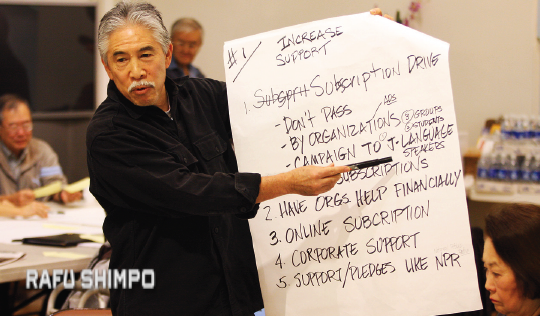 I knew people by name and face but had never worked with the other members of the committee since they were Little Tokyo-based or connected to institutions in Little Tokyo: Terry Hara, Dan Mayeda, Debra Nakatomi, Terry Toshio Handa, and Shunji Muso. It was unfortunate that, with so much talent and experience, our committee dissolved within a year. It was difficult. We were “outsiders” trying to work with a family institution. Gwen and I continued to meet up for breakfast every few months – just to talk and commiserate about the challenges and difficulties. Two weeks ago, Gwen and Jordan Ikeda asked me to meet with them and talk over breakfast in Gardena. I was stunned to hear Jordan say they figure The Rafu has maybe nine months before it may have to fold. Nine months! Plus, he stated the deficits of the past few years in dollar amounts. Not enough subscriptions — both print and online — not enough ads, and no money to replace decades-old equipment. On top of that, the employees have not had a raise in how many years, which I knew. The Rafu has been my only source to reach the older Nikkei community. The early forums attracted up to 350 people as I shared my experiences with death, dying and the grieving process. “Iku’s Box,” as it has commonly become known, is still requested, going on ten years. I guesstimate 2,000 plus people have attended. This past March 6, on a rainy Sunday, 216 people showed up at the GVJCI for the forum on complementary alternative and integrative medicines. I send emails out, but the majority come via the articles in The Rafu. I have become friends with some people who have attended over the years. In many cases, I know their names but not their faces. If The Rafu does fold in December, how will I communicate with everyone? I may not do another forum for a long time or ever, since experiences trigger the forums. But if and when I do, will I no longer have The Rafu to let you know? George “Horse’s Mouth” Yoshinaga had a huge senior following. What would he say if he were here to witness yet another demise of a Japanese American vernacular? I will no longer be able to read the columns by the Rafu columnists: Bill Watanabe, Ellen Endo, Bill Yee, Guy Aoki, George Johnston, Trisha Murakawa, Phil Shigekuni, and on and on. My daughter, Traci, will no longer have The Rafu to run her poems. The helpful legal, financial and health columns. And, of course, Maggie. But, WAIT JUST A DOGGONE MINUTE! Do we have to say, “Oh, well” and let The Rafu shut down? Do we HAVE to be a COMMUNITY WITHOUT A PAPER? If every one of you who “inherits” The Rafu were to subscribe, how many hundreds – thousands? – of subscriptions would that alone come to? If every grandparent gifts their grandchildren with a one-year online subscription ($50), how many thousands would that be? A big question, in addition to raising the number of subscriptions, is: What would make the younger members of our community, the Yonsei and the millennials WANT to read The Rafu? If they get an online subscription or a print copy but don’t look at it, how would that help the future of The Rafu? It wouldn’t. “Content” needs to be addressed. Traci told me “Angry Asian Man,” essentially an online home-based website, has avid followers among the younger generation – nationwide. Her friend Sean Miura said he “grew up” in the Midwest with the “Angry Asian Man” and the relevant community issues that it addresses on a daily basis. It became his pipeline to the JA community.